Susan Sontag's On Photography is a seminal and groundbreaking work on the subject. Susan Sontag's groundbreaking critique of photography asks forceful questions about the moral and aesthetic issues surrounding this art form. Photographs are everywhere, and the 'insatiability of the photographing eye' has profoundly altered our relationship with the world. Photographs have the power to shock, idealize or seduce, they create a sense of nostalgia and act as a memorial, and they can be used as evidence against us or to identify us. In these six incisive essays, Sontag examines the ways in which we use these omnipresent images to manufacture a sense of reality and authority in our lives. One of America's best-known and most admired writers, Susan Sontag was also a leading commentator on contemporary culture until her death in December 2004. Her books include four novels and numerous works of non-fiction, among them Regarding the Pain of Others, On Photography, Illness as Metaphor, At the Same Time, Against Interpretation and Other Essays and Reborn: Early Diaries 1947-1963, all of which are published by Penguin. A further eight books, including the collections of essays Under the Sign of Saturn and Where the Stress Falls, and the novels The Volcano Lover and The Benefactor, are available from Penguin Modern Classics. To ask other readers questions about On Photography, please sign up. The influence of the image on society is enormous. Very many ideas are perceived by society through images. Images are imprinted very deeply at the subconscious level? This was terribly interesting, but I think you needed to know a little more than Sontag explained to understand where she is coming from in all this. The important thing to remember is that Plato wanted to banish the artists and he wanted to do this for a very good reason. To Plato the world we live in isn’t really the real world – the real world is a world we cannot have access to, the real world is where things never die, things remain the same and don’t change. Change and death, to Plato, are This was terribly interesting, but I think you needed to know a little more than Sontag explained to understand where she is coming from in all this. The important thing to remember is that Plato wanted to banish the artists and he wanted to do this for a very good reason. To Plato the world we live in isn’t really the real world – the real world is a world we cannot have access to, the real world is where things never die, things remain the same and don’t change. Change and death, to Plato, are proof that the world we live in isn’t the real world. So, Plato saw the world we live in as a world of shadows, that is, one step away from reality. Art was therefore two steps away from reality and was therefore a copy of a copy. For Plato what we needed to do was get closer to reality, not further away from it. Therefore, he needed to banish artists from his ideal society as they move us away from reality towards images - that is more shadows. Painting is also a high-art form. She makes the point that art is hard work, “Classical modernist painting presupposes highly developed skills of looking, and a familiarity with other art and with certain notions about art history. “ Page 102 But photography presents itself as realism – realism in the sense that all you need are a pair of eyes to understand what is being shown to you. Of course, this is anything but the case, but we will get to that in a second. Chinese government approved of were more likely to be of the ‘Unknown Citizen Lei Feng – someone too good to be true and therefore worthy of emulation. As Sontag says, “In China, what makes an image true is that it is good for people to see it.” Page 137 That is, not the images literal truth – which everyone probably knows is almost certainly staged - but rather the truth as it ‘ought’ to be. Yet again, another hidden truth. I said before that Sontag doesn’t believe we can use photographs to understand – that photographs show the apparent, and to understand means to go beyond the appearance. But I think this quote on Belfast shows that photographs can help us to reach some kind of understanding. The people of Belfast in 1974 (with nearly 30 years of the Troubles ahead of them) were confronted by something that must have seemed completely alien to them – civil war in the streets of their home town. That is, they would have been confronted daily with the bizarre, surreal, unreality of what was a new reality forever ready to assert its own all-too-real-ness. How does one come to terms with this new ‘reality’? Photographs helped them to make sense of such a surreal world. “Neil Shawcross, a Belfast man, bought two complete sets of the cards, explaining, ‘I think they’re interesting mementoes of the times and I want my children to have them when they grow up.’” Little did he know his children would have far more mementoes of those times in their own growing up. I found this book utterly maddening. I'm giving it four stars not for the content itself, but for the quality of thinking I did while reading. I'm rather surprised not to have found any comments in other reviews regarding Sontag's horrific tactlessness in her discussions of "freaks" (in the context of Diane Arbus' work). Less shocking but also disappointing: her wholesale dismissal of the Surrealists, or as she calls them two or three times, the Surrealist "militants", which they decidedly were I found this book utterly maddening. I'm giving it four stars not for the content itself, but for the quality of thinking I did while reading. I'm rather surprised not to have found any comments in other reviews regarding Sontag's horrific tactlessness in her discussions of "freaks" (in the context of Diane Arbus' work). Less shocking but also disappointing: her wholesale dismissal of the Surrealists, or as she calls them two or three times, the Surrealist "militants", which they decidedly were not. I've never read anything by Susan Sontag, but encountered mentions of her book On Photography numerous times in various contexts. It's hailed as "one of the most highly regarded books of its kind". I like taking photographs myself, and thought I would find it interesting. Those seeking a well-constructed history of photography, its development and an introduction to various schools and movements of photography - as I did - are likely to be disappointed. On Photography has no central thesis, and i I've never read anything by Susan Sontag, but encountered mentions of her book On Photography numerous times in various contexts. It's hailed as "one of the most highly regarded books of its kind". I like taking photographs myself, and thought I would find it interesting. Those seeking a well-constructed history of photography, its development and an introduction to various schools and movements of photography - as I did - are likely to be disappointed. On Photography has no central thesis, and is a collection of essays "about the meaning and career of photographs" as described by Sontag herself. This isn't a book on photography - it's a book on Susan Sontag. Although she writes about a wealth of photographers, Sontag doesn't explore any of them in depth - she moves from one to another very quickly, and often they are reduced to backgrounds for her own thoughts and opinions on photographs, which often include comparisons and references to other media. This can make for some very dense reading - I thought that the book suffered painfully from a lack of a central thesis. My biggest gripe with the book is that while by nature it has to be a polemic - it contains no bibliography or citations - Sontag constantly makes sweeping generalizations about both photography and photographers without offering any explanation. She presents her opinions as if they were facts, entirely without nuance, leaving no room for disagreement. To give her credit she has a multitude of opinions, and to praise or dismiss them all completely out of hand would be unfair, but many of her claims are very dubious: such as stating that tourists who enjoy taking snapshots of what they see do it because they know no other response, and for some it's the only way to appease their anxiety about not working (citation needed, unless we're going to stereotype whole nations). The camera as phallus is, at most, a flimsy variant of the inescapable metaphor that everyone unselfconsciously employs. However hazy our awareness of this fantasy, it is named without subtlety whenever we talk about “loading” and “aiming” a camera, about “shooting” a film. Like guns and cars, cameras are fantasy-machines whose use is addictive. However, despite the extravagances of ordinary language and advertising, they are not lethal. In the hyperbole that markets cars like guns, there is at least this much truth: except in wartime, cars kill more people than guns do. The camera/gun does not kill, so the ominous metaphor seems to be all bluff—like a man’s fantasy of having a gun, knife, or tool between his legs. Still, there is something predatory in the act of taking a picture. To photograph people is to violate them, by seeing them as they never see themselves, by having knowledge of them they can never have; it turns people into objects that can be symbolically possessed. Just as the camera is a sublimation of the gun, to photograph someone is a sublimated murder—a soft murder, appropriate to a sad, frightened time. Melodramatic writing like this strikes me as beyond silly; the idea that people might not only consent to be photographed but want to have their photograph taken and actively seek that opportunity is never considered. While it's a good paragraph from a literary perspective - cameras become guns, people are possessed by celluloid voodoo, and taking their photos is just a slightly better way of murdering them - it's the kind of writing that George Orwell famously described as being designed to "give an appearance of solidity to pure wind". All these essays have been written in the 1970's, long before the advent of both the internet and digital photography - which has transformed the medium completely, as it's now surrounding us completely, included in everything that we do. What would Susan Sontag say about people chuckling at funny cat pictures? I'm afraid the thought didn't even cross her mind. The malicious motives that Susan Sontag gives to all photographers have been largely replaced with people sharing the joy of taking photographs with others: people take photographs of themselves and share them with each other, connecting in ways which were previously impossible. I've read that Susan Sontag later turned back from some of the views that she held while writing On Photography - it's a shame this self-dissent was not included. The above six essays simply make up of the most highly regarded and thoroughly interesting books of its kind. I'm a big fan of Roland Barthes's 'Camera Lucida' (although about photography it's more a personal book dealing with the loss of his mother) and this was equally as good if not better. Sontag raises important and exciting questions about photography and raises them in the most readable and thought-provoking way. I always have fears when approaching essays, like will they turn into a bore-feast or feel like a homework assignment, but no, there was never a dull moment, Sontag didn't make me feel like nodding off. Photography, unlike painting, does not only address and represent its object and does not only resemble it; it is also a part of the object, its direct extension. Photography, according to Sontag, is a form of acquisition in a number of ways. When you photograph something, it becomes a part of certain knowledge system, adapted to schemas of classification and storage starting from family photographs up to police, political and scientific usage. Photography, in other words, is a form of supervision. Throughout time reality has been related through countless images, and philosophers such as Plato have made efforts to diminish our reliance on representations by pointing at a direct way to grasp the real. Sontag quotes Feuerbach in saying that our age prefers the photograph to the real thing, the appearance before the experience. This argument, she points out, is widely accepted in modern culture which is constantly engaged with producing and consuming images to such a degree that photography has been made essential for the health of the economy and the stability of social structures. Photography, holds an almost unlimited authority in modern society. Such photographic images are capable of replacing reality by virtue of being not only a mirror or interpretation of in, but also a relic of reality, something that is taken straight from it. We seem to consume photographs at an ever increasing rate and they are therefore consumed and simply need to be replaced. Meaning, the more we take photographs the more we need to take photographs, and this accounts for what is known today as the pictorial turn. Step one: buy this book. Step three: go on the subway/metro/pvta and go! you will want to underline just about every sentence because it is life changing. You will want to hug your camera and then throw it into a fire. You will never approach the world the same again. And then go read Regarding the Pain of Others, because it will be like playing Candyland. I approached On Photography expecting a sense of warmth and intellect that Maria Popova paints Susan Sontag with. One essay in, I was slightly disappointed to feel no warmth. So, I read an interview of hers where the interviewer says the "yes and no" attitude is typical of her writing, something that I had experienced as well. She responds by saying that it is not yes and no, rather this but also that. She argues in defence of the premise of seriousness, an idea both close to my heart and valuab I approached On Photography expecting a sense of warmth and intellect that Maria Popova paints Susan Sontag with. One essay in, I was slightly disappointed to feel no warmth. So, I read an interview of hers where the interviewer says the "yes and no" attitude is typical of her writing, something that I had experienced as well. She responds by saying that it is not yes and no, rather this but also that. She argues in defence of the premise of seriousness, an idea both close to my heart and valuable for the essays in this volume. Seriousness does not mean the heaviness equates it to, rather slow, deliberate rigour. A quality present in all the essays as she entertains many aspects of photography for the benefit of the reader. Sontag looks at photography from the perspective of the photo, the photographer and the viewer. She discusses how photography has changed the equation of an individual's association with the rest of the world in her essay, In Plato's Cave. Photographs fiddle with the scale that one is trained to see the world, and the notion of time that we have collectively accepted. An intriguing idea is that photography can only reinforce a moral position, not create one. This was one of the many ideas I hadn't thought about before, ideas that seemed to hold ground but I would have liked to discuss them. This is a really good book to read as a group. I went through my notes and reread several parts of the collection after reading a review that chastised Sontag for her content, because it was very much unlike my reading. I'd noticed Sontag's euphemism free critique of Diane Arbus, yet I did not consider her derogatory. This is a contentious debate that will probably give rise to a lot of presentism sins, so I won't discuss that. On Diane Arbus' work, I'm not convinced she didn't approve of it. In America, Seen through Photographs she evokes Walt Whitman's notion that beauty and ugliness being immaterial in an inclusive embrace of the real. Arbus's wikipedia page suggests that Sontag opposed the lack of beauty in Arbus' work and its failure to make the viewer feel compassionate about Arbus' subjects. I checked the citations for it, a paper published after Sontag's death. I haven't read the paper but from my reading of this work, Sontag simply stated that Arbus' work wasn't meant to stir compassion. Arbus's photographs - with their acceptance of the appalling - suggest a naivete which is both coy and sinister, for it is based on distance, on privilege, on a feeling that the viewer is asked to look at is really other. Bunuel, when asked once why he made movies, said it was "to show that this is not the best of all possible worlds." Arbus took photographs to show something simpler - that there is another world. I agree with her and I love Arbus' work. For a person who hates taking pictures and having my picture taken, I really love Arbus for the same reason. Another piece from the New Yorker says she notes with bemusement of Arbus' subjects who are “pathetic, pitiable, as well as repulsive” look “cheerful, self-accepting, matter-of-fact.” She wondered, “Do they know how grotesque they are? It seems as if they don’t.” They “appear not to know that they are ugly.” Looking at how the author has cherry picked the statements. it looks like either a deliberate case of misconstruing what an author meant to say or not even trying to understand*. Sontag quotes Nietzche, To experience a thing as beautiful means: to experience it necessarily wrongly and as I mentioned earlier, also Walt Whitman at the very beginning of the essay. These are the ideas she carries of beauty. Her statements on Arbus' photography and subjects are about how Arbus transcends the limited ideas of beauty, to produce a work that accepted another world. Photography is not an art, it is a medium, like writing, than can be used to produce art, document events, entertain, lie and any other thing you want it too. The appeal of this idea is that in is accepting of the numerous claims of the "purpose of photography" that Sontag writes about. As Wittgenstein argued for words, that the meaning is in the use - so for each photograph. I've recently taken a fancy for the idea for vignettes and fragmented writing. Photographs are probably one of the most obvious forms of fragmentation and this essay makes a case against the truths that can be rendered in a dissociated moment.. However significant a single event. it cannot embed a wholeness required to understanding. This idea reminds one of the role that the viewer plays in photography. The last section, is a fascinating one. A homage to Walter Benjamin through A Brief Anthology of Quotations. Quotes from philosophers, photographers, and even ads of camera makers. There are quotes her that almost entirely oppose one and other. They all sit together in one chapter as if to mock the very ideas of true and false. Taking photographs is an undeniable part of everyday life, and like all widely prevalent activities, it is not thought about by those who practice it. This makes Sontag's essay immensely valuable, especially because she doesn't really come to any conclusion. Of Photography, she says this, but also that. A dense and theoretical book on a subject I know very little about. She refers to a vast collection of exhibits, and all I knew before is 'point a camera at a thing and press a button'. Sontag is very forceful and eloquent in her opinions. I can see her turning Plato's idea of forms and representation right on its head, but the question of 'stealing' life or emotion by photography is a more puzzling one. Would it be possible to 'steal' others experiences and suffering in writing? A wonderful essay on the art of photography. Susan Sontag starts her book on photography with a reference to Plato's cave, a dark prison only a few escape. This is not accidental. It defines and presages the thinking that underlies the whole book. By placing a reference to Plato at the very beginning Sontag is telling us: 'I subscribe to the fundamental Platonic principles: the real world vs. the world of imitations. Forms vs. art. Reality vs. the cave.' Or something like that. So what does this entail for her analysis of photography? Sonta Susan Sontag starts her book on photography with a reference to Plato's cave, a dark prison only a few escape. This is not accidental. It defines and presages the thinking that underlies the whole book. By placing a reference to Plato at the very beginning Sontag is telling us: 'I subscribe to the fundamental Platonic principles: the real world vs. the world of imitations. Forms vs. art. Reality vs. the cave.' Or something like that. So what does this entail for her analysis of photography? Sontag is angry at photography. She's angry because photography lacks the means (or so she thinks) to distinguish between truth and falsity, compassion and detached observation. Instead, photography allies itself either with the early, optimistic humanism of, say, Walt Whitman (every person is the same, everyone is equal with everyone else, everyone deserves as much to be photographed as everyone else) or with the later humanism of Andy Warhol (again, everyone is the same, everyone is equal with everyone else, no subject has more of a right to be photographed than anyone else). Why is this a problem, we might ask? Sontag does not spell this out very clearly, but her analysis points to a failure on the part of photography to make itself an instrument of politics and history. Sontag regrets the fact that by photographing each and every subject without concern for the context photography abstracts from the historical specificity that gives meaning to that subject. She also laments photography's failute to be politically engaged. But what about those photographs that have shaped the public's perception of humanitarian wars and disasters, you might ask? What about the photograph of the naked, napalmed Vietnamese girl that had an impact on American public opnion about the Vietnam war? Sontag replies that it's not the photographs themselves that alter public perceptions but an ideological framework that predates these photographs and allows them to have an impact. She may be right in this. But doesn't this apply equally to any other endeavour to bring atrocities to public attention? Isn't journalism or activism subject to the same vicissitudes? Here's where Sontag's Platonism kicks in; photography fails because it cannot bring about a political moment of truth that disperses the fantasies of the cave and forces the cave prisoners out into the open where they will be confronted by reality. It fails because it cannot bring about understanding. But if photography can't, then what can? Political analysis? Speeches? Activism? Necessary as these are in their own right, they are as tied to the overarching framework as photography is (although an analysis committed to understanding, as Sontag's is, would like to think not). Needing to have reality confirmed and experience enhanced by photographs is an aesthetic consumerism to which everyone is now addicted. Industrial societies turn their citizens into image-junkies; it is the most irresistible form of mental pollution. It is true in our modern day, as it was apparent to Sontag 50 years ago, that people have become addicted to photographs, and indeed that this addiction is a mental pollution. It has given rise to the kind of vacuous celebrity as the Kardashian cadre, famous basically for their cumulative navel-gazing and insipid banter. Photography has not only made us obsessed with ourselves, but has also made us obsessed with the way we are viewed by others, and the way by which we view and judge others. We do not take pictures for ourselves, but for the vacant appeal to the unidentified masses - love me! But do not love me as I am, love me only as I aspire to be, as I can angle and contort myself to be, for the duration of a shutter-click. 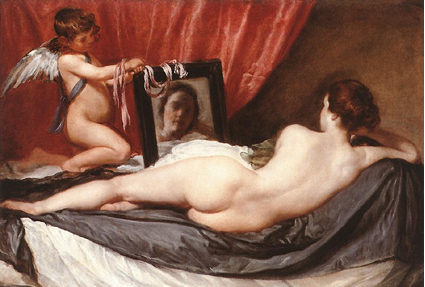 We see Venus, lying in bed, looking at herself in the mirror - or so we think. 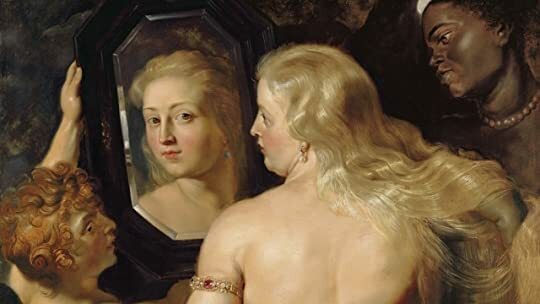 But if you examine the angles, you notice that it is not possible for her to be viewing her own face in the mirror, because the reflection facing the artist is head-on, it must be that what she sees is in fact the artist. Remove the artist and replace him with the figureless audience of society. It is a perversion of narcissism - not to look longingly at oneself, but to preen and present oneself, gazing into an abyss and hoping for the abyss to gaze back, approvingly. For one, in a society so image-obsessed, the corrosion of beauty with age has made and supported the cosmetics industry to the gargantuan size that it has become. Photographs combat the effects of time. Like Dorian Gray's portrait, the series of photos we present to the world represent our best selves, which are impervious to age and destruction - the time and corrosion which we bear to preserve their beauty. Sontag is quite aware of the role photographs have in preserving a false sense of immortality. They preserve that which is endlessly fleeting. Barthes notes that the subjects of photos are "anesthetized and fastened down, like butterflies." They are images chained down and de-contextualized, they simply are, and are expected to speak for themselves, while simultaneously being gagged. Yet we don't mind gagging ourselves, silencing ourselves, pinning ourselves down, chaining ourselves to a reality that is skewed and misrepresented - and for what? To appeal to strangers in the void of the internet. We have lost our ability to appreciate the attentions of individuals because we have become so fixated on appealing to the swarming masses. We do not seek love, but orgiastic attention. Desire has no history - at least it is experienced in each instance as all foreground, immediacy. It is aroused by archetypes and is, in that sense, abstract. But moral feelings are embedded in history, whose personae are concrete, whose situations are always specific. Thus, almost oppostite rules hold true fro the use of the photograph to awaken desire and to awaken conscience. On hold. While fascinating, 'every sentence contains a thought' is not as fun as it sounds. Żyjemy w epoce obrazów. Współczesny człowiek przyswaja je dużo szybciej niż tekst. I może choćby dlatego warto sobie przypomnieć, co o fotografiach pisała Susan Sontag w swoich esejach, które rok temu wydało w nowym, odświeżonym tłumaczeniu wydawnictwo Karakter. „O fotografii” jest w tej chwili pozycją już niemal kultową. Choć zbiór ukazał się po raz pierwszy w 1977 roku, to nie stracił tak bardzo na aktualności. Teksty ze zbioru „O fotografii” wolne są od technicznego żargonu. Nie ma tu mowy o Żyjemy w epoce obrazów. Współczesny człowiek przyswaja je dużo szybciej niż tekst. I może choćby dlatego warto sobie przypomnieć, co o fotografiach pisała Susan Sontag w swoich esejach, które rok temu wydało w nowym, odświeżonym tłumaczeniu wydawnictwo Karakter. „O fotografii” jest w tej chwili pozycją już niemal kultową. Choć zbiór ukazał się po raz pierwszy w 1977 roku, to nie stracił tak bardzo na aktualności. Teksty ze zbioru „O fotografii” wolne są od technicznego żargonu. Nie ma tu mowy o naświetlaniu, przysłonie czy ekspozycji. Pojawiają się za to takie słowa jak kompozycja, perspektywa czy układ. Można więc powiedzie, że Sontag podchodzi do analizy problemu zdjęć bardziej jak do malarstwa, choć wyraźnie wskazuje w jednym z esejów, że między tymi dwoma sztukami może być więcej różnic niż podobieństw, jeśli się na nie pojrzy z odpowiedniej strony. W swoich rozważaniach nie poświęca technicznej stronie fotografowania zbyt wiele miejsca, gdyż to co najważniejsze kryje się na zdjęciach, a nie w sposobie ich robienia. Sontag w mistrzowski sposób konstruuje w każdym eseju spójny wywód. Nierzadko korzysta z dygresji, niekiedy tak szerokich, że aż trudno uwierzyć, że uda jej się wrócić do początkowego tematu. A jednak wraca, łącząc ze sobą wiele wątków poruszanych w refleksyjny sposób i zamyka całość klamrą kompozycyjną, która zachwyci czytelników zwracających uwagę nie tylko na treść, lecz również formę eseju. W typowy dla siebie sposób autorka drąży temat, wyciskając z niego wszystko, co się da. Zauważa dualizm fotografii i pisze o niej w sposób, który sugeruje, że tak wielkiego i skomplikowanego zjawiska nie da się jednoznacznie ocenić. Fotografia uwrażliwia, ale i znieczula. Pokazuje zarówno piękno świata jak i jego brzydotę. Wzbogaca i zubaża widzenie rzeczywistości. Sontag jest w swoich rozważaniach bezwzględna. Jej spostrzegawczemu oku, nic nie jest w stanie umknąć. Ocenia, analizuje i snuje refleksje, zmuszając odbiorcę jej pracy do ciągłego zastanawiania się nad podejmowanym problemem. Co ważne, z tymi tekstami można polemizować. Nie ma tu konkretnych tez czy też myśli, za którymi należy podążać. Autorka zadaje raczej pytania, poddaje niektóre zjawiska w wątpliwość, sama szuka odpowiedzi, starając się patrzeć na fotografie i jej autorów z jak najszerszej perspektywy. Niektórzy mogą twierdzić, że teksty Sontag są już nieaktualne. Ale czy rzeczywiście? Bez wątpienia wynalezienie aparatu fotograficznego, a następnie ułatwienie do niego dostępu zmieniło nasze postrzeganie świata. Inaczej patrzymy na otaczających nas ludzi, naturę, miasta, w których mieszkamy i wszystko inne, co nas otacza. Za pomocą zdjęć staramy się nie tylko utrwalić dany moment naszego życia, ale przede wszystkim go sobie przywłaszczyć, podkreślając aż zanadto jak kruche i ulotne są chwile. Może nie nosimy już ze sobą aparatów, lustrzanek czy kompaktów, bo wszystko, co potrzebne do wykonywania zdjęć mamy w telefonach. To z kolei w pewnym sensie zubaża i wiele zabiera całemu rytuałowi fotografowania. Zdjęć jest tyle, że otaczają nas z każdej strony. O tym wszystkim Sontag pisze w swoich esejach i aż dziw bierze, jak wiele można z nich współcześnie wyciągnąć. Spostrzeżenia Sontag może nie są z punktu widzenia dzisiejszego czytelnika rewolucyjne albo świeże. Są jednak trafne, a przede wszystkim, mogą niektórym uświadomić wagę problemu, o którym podświadomie już kiedyś się myślało. Nie od dziś wiadomo, że człowiek potrafi zmienić perspektywę patrzenia na jakiś problem, gdy ktoś inny opowie mu o nim w odpowiedni sposób. A prace Sontag można nazwać właśnie takim opowiadaniem. Widać, jak wiele zaangażowania i pasji autorka zostawiła na kartach tego zbioru. Świadczy o tym przenikliwość, ogromna wiedza oraz staranność prowadzenia wywodu. Eseje podejmujące problem fotografii wzbudzają podziw. Dla wielu może być to ożywcza lektura, napisana lekkim, lecz błyskotliwym stylem. Dla innych z kolei, eseje będą zachwycać przede wszystkim aktualnością spojrzenia, może zmuszą do zastanowienia się nad niektórymi aspektami fotografii, która po lekturze prac Sontag wydaje się zjawiskiem wręcz kontrowersyjnym. Nikt inny nie potrafi w taki sposób zadawać pytań i zachęcać do rozmyślań na temat znaczenia i wartości obrazów, jednocześnie przybliżając kilka sylwetek mistrzów ich utrwalania. Wydaje się, że takich prac nie wystarczy przeczytać raz. Wracając do nich, można w każdym eseju odkrywać coś nowego. A wracanie do pióra Sontag to sama przyjemność. 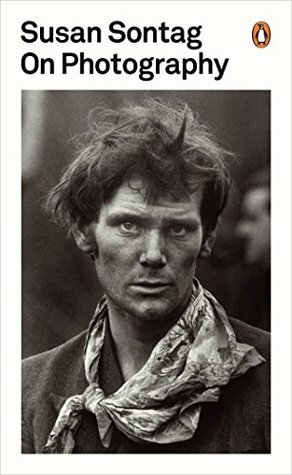 This is a classic book of essays about how photography reveals so much about society, politics, history, and our attitudes towards preserving the image and the potential "truth" inherent in a photograph. I don't read much nonfiction, and this was originally for a class, but there isn't a single person I wouldn't recommend this to. Q: Why is this book called "On Photography"? Given that not one word of this book says sustains a single positive sentiment about cameras and their usage, why wouldn't it be called "Against Photography," or maybe "Photography is the Downfall of Human Kind." This is not at all the book I thought it was. Given its most quoted statement, "To collect photographs is to collect the world," I expected a somewhat romantic vision of the photographic craft. Little did I know that Sontag credits photography Q: Why is this book called "On Photography"? Given that not one word of this book says sustains a single positive sentiment about cameras and their usage, why wouldn't it be called "Against Photography," or maybe "Photography is the Downfall of Human Kind." This is not at all the book I thought it was. Given its most quoted statement, "To collect photographs is to collect the world," I expected a somewhat romantic vision of the photographic craft. Little did I know that Sontag credits photography with dehumanization, desensitization to violence and graphic imagery, and our alleged inability to experience reality in three dimensions. With every passing page, my jaw dropped further; how could a woman who was romantically involved with Annie Liebovitz abhor photography so much? كنت قد قرأت كتاب سوزان سونتاغ (الالتفات إلى ألم الآخرين)، والذي تناول الصور الملتقطة والتي تمثل آلام الآخرين، في الحروب خاصة، جمال ذلكم الكتاب جعلني أعود لقراءة كتابها الأقدم (حول الفوتوغراف) والذي تناول التصوير بشكل عام، محاولاً تحليل تحولاته ومدى تأثيريته على الإنسانية، من خلال مصورين مختلفين كانت لهم مشاريع تصويرية متعددة. امر واقعی اندوهی در خود دارد . و آن اندوه زیبایی است . The first 2-3 essays of the book are just astonishing. I've been perusing Sontag's journals for the past year or so, and her intellectual range leads you perilously near to pure jealousy, but then you concede her anomalous mind and simply admire it instead. This seemingly limitless curiosity and brute capacity for knowledge is best exhibited in those first 2-3 essays (particularly the first two, which is why I keep saying "2-3"), and also remains less cloyingly didactic there. For example, her c The first 2-3 essays of the book are just astonishing. I've been perusing Sontag's journals for the past year or so, and her intellectual range leads you perilously near to pure jealousy, but then you concede her anomalous mind and simply admire it instead. This seemingly limitless curiosity and brute capacity for knowledge is best exhibited in those first 2-3 essays (particularly the first two, which is why I keep saying "2-3"), and also remains less cloyingly didactic there. For example, her consideration of Diane Arbus at length maintains a level of contemplation and engagement - a recognition of both the potentially nihilistic and exploitative registers of Arbus's "freak" work and its power of imagination and sidewise cultural commentary - that falls by the wayside in the latter half of the book, where I felt lectured to in a more dogmatic mode. The later essays tend to sound polemical, in the negative sense of that word, rather than exploratory. "On Photography" is the most brilliant book on photography I have ever read, or ever will read. Questioning the nature of photography--its purpose, meaning, future--Sontag forces us to consider revolutionary ideas about the simple act of "snapping" up the world. Of her string of brilliant observations, my favorites include the notion that taking someone's picture is akin to participating in their mortality, the idea that as soon as a photograph is taken, we've witnessed a second of their life ex "On Photography" is the most brilliant book on photography I have ever read, or ever will read. Questioning the nature of photography--its purpose, meaning, future--Sontag forces us to consider revolutionary ideas about the simple act of "snapping" up the world. Of her string of brilliant observations, my favorites include the notion that taking someone's picture is akin to participating in their mortality, the idea that as soon as a photograph is taken, we've witnessed a second of their life expiring. Also equally powerful is the idea that photography--in the realm of war--is essentially encouraging whatever is happening "to keep happening," which is odd and cruel, Sontag claims, when your subject matter is suffering. Sontag, too, explores the role of photography in the realm of the domestic American family, how those who take the most photographs were "robbed of their childhoods" and seek to create a world they can control and press into eternity. Similarly, photography becomes a creator of revised memory in families that, under the surface, experience great dysfunction, pain, and disconnectedness. There are thousands of other gems in this genius book, and I can not recommend Sontag's meditation enough for photographers or anyone else disturbed by the prevalence of image in our society, what it means (when we really look at it), and the future of our psychology. This is the worst book I've read about photography. It isn't even about photography, it is about Susan Sontag consistently misunderstanding photographs. It isn't intellectual, either. It is her emotional responses to the shallowest possible reading of photographs. The defining moment is in the appendix of quotations, the only good part of the book. The first quote is from the notebooks of William Henry Fox Talbot, one of the earliest photographers. He wrote, "Make picture of kaleidoscope." This This is the worst book I've read about photography. It isn't even about photography, it is about Susan Sontag consistently misunderstanding photographs. It isn't intellectual, either. It is her emotional responses to the shallowest possible reading of photographs. The defining moment is in the appendix of quotations, the only good part of the book. The first quote is from the notebooks of William Henry Fox Talbot, one of the earliest photographers. He wrote, "Make picture of kaleidoscope." This idea of photography as painting with light is utterly outside the simplistic readings of photography in Sontag's book.
" To photograph is to confer importance. There is probably no subject that cannot be beautified; moreover, there is no way to suppress the tendency inherent in all photographs to accord value to their subjects. But the meaning of value itself can be altered "
" Through photographs we follow in the most intimate, troubling way the reality of how people age. To look at an old photograph of oneself, of anyone one has known, or of a much photographed public person is to feel, first of all: how muc " To photograph is to confer importance. There is probably no subject that cannot be beautified; moreover, there is no way to suppress the tendency inherent in all photographs to accord value to their subjects. But the meaning of value itself can be altered "
" Through photographs we follow in the most intimate, troubling way the reality of how people age. To look at an old photograph of oneself, of anyone one has known, or of a much photographed public person is to feel, first of all: how much younger I (she, he) was then. Photography is the inventory of mortality. A touch of the finger now suffices to invest a moment with posthumous irony. Photographs show people being so irrefutably there and at a specific age in their lives; group together people and things which a moment later have already disbanded, changed, continued along the course of their independent destinies. " هذا ما أحبّه في التصوير الفوتوغرافي ، الجميع متساوون ، القبيح يتحوّل بقدرة قادر إلى فائق الجمال . وهذا ما طرحته سوزان في كتابها . أنا لستُ بالفوتوغرافر ، لكنّي أستمتع جدا بالتأمل في الصور الفوتوغرافية ، الغريبة الجميلة اللي فيها فكرة ... و إستمتعت أيضا بقراءة الكتاب ، تسرد فيه سونتاغ الصورة الفوتوغرافية ، تأثير الصورة في المجتمع ، و قد ايش ماتغيّر في حيوات ناس ، ناهيك عن تجارب المصورين المختلفين في التصوير الفوتغرافي ، تتحدث عن الصورة من الكاميرا إلى تعليقها على الحائط ، تنهيها بإقتباسات قيلت في هذا ما أحبّه في التصوير الفوتوغرافي ، الجميع متساوون ، القبيح يتحوّل بقدرة قادر إلى فائق الجمال . وهذا ما طرحته سوزان في كتابها . The book does a good job at making me, a photographer, reflect on what photography is, despite being boring at times with its repetition. The examination of what photography is as an art and how it relates to previous and future arts is a major focus of the book. Photography's realistic or surrealistic tendencies are examined here extensivly. Additionally the book examines the abilities and limits of photography to interpert or create reality, to modify reality, to create change. Also interesting is a section on what photography means to art. Perhaps as the end of the limited edition?? It was a good book, dealing not at all with the technical aspects of photography but attempting instead to examine photography through the eye of philosophy. p18 Korea vs Vietnam Photo's....interesting analysis of why Korea photo's were not important...and COULD NOT have been. p40 Art changes morals; tendency in capitalist countries for art to reduce moral and sensory queasiness. p41 Camera as freeing photographer from any responsibility toward the photographed. p 107 Possible montage suggested (Che's Death, Mantegna's Dead Christ, and Rembrant's Anatomy lesson of Prof. Tulp. p107 Photography as beautifying....even the most deplorable conditions can look beautiful through a photograph. p149 Photography(and printing press) as democratization of arts....changing fine arts ideas of originals and reproductions off the map. •	Wittgenstein said that the meaning of words is in the use of them not in their meaning. I first read the article from which this book was born when I was doing my MFA (2000), picked up the book at a used book store several months ago and have been reading chapters in the midst of other reads, projects, etc. Sontag's ideas are so culturally important and have been so assimilated into what we "already know" that it may be difficult at first glance to see how remarkable her contributions were back in the day (1977?) when she first began to articulate them... or how relevant they conti I first read the article from which this book was born when I was doing my MFA (2000), picked up the book at a used book store several months ago and have been reading chapters in the midst of other reads, projects, etc. با اینکه هدف اصلیِ کتاب بررسی فلسفیِ عکاسی است، اما اطلاعات بسیاری هم در ارتباط با عکسها و عکاسهای مهم تاریخ به آدم میدهد. کتابِ بسیار لذتبخشی بود برام؛ منتها به نظرم توضیح و تفصیلش در بعضی موضاعات بیش از حد کافی بود. کتابِ اصلی و یکی از دو ترجمهٔ موجود، هیچ تصویری ندارند؛ اما من نسخهٔ انتشارات حرفه نویسنده با ترجمهٔ نگین شیدوش را خواندم که بیشتر عکسهای مطرح در مطالب را هم به کتاب اضافه کرده است. پیشنهاد میکنم اگر ترجمهٔ بدون عکس را هم میخوانید، هر عکسی که بهش اشاره شد را گوگل کنید و ببینید. با این‌که هدف اصلیِ کتاب بررسی فلسفیِ عکاسی است، اما اطلاعات بسیاری هم در ارتباط با عکس‌ها و عکاس‌های مهم تاریخ به آدم می‌دهد. کتابِ بسیار لذت‌بخشی بود برام؛ منتها به نظرم توضیح و‌ تفصیلش در بعضی موضاعات بیش از حد کافی بود. کتابِ اصلی و یکی از دو ترجمهٔ موجود، هیچ تصویری ندارند؛ اما من نسخهٔ انتشارات حرفه نویسنده با ترجمهٔ نگین شیدوش را خواندم که بیشتر عکس‌های مطرح در مطالب را هم به کتاب اضافه کرده است.